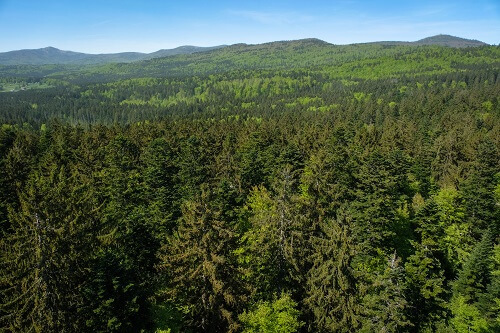 Bavarian Forest is one of the National Parks in Germany – in fact Bavarian Forest was the very first national park in the country, established in 1970. 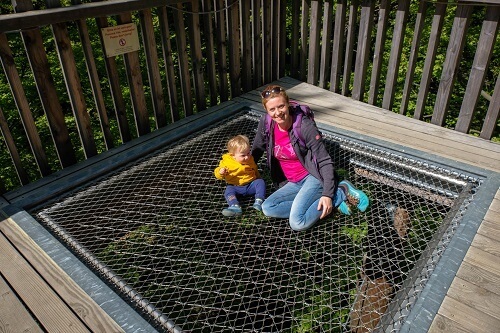 When we were preparing a rough plan for our new roadtrip around Germany, we wanted to stop at the Bavarian Forest National Park solely for one reason – its Sky Walk Baumwipfelbad, which takes you up to the tree tops and later on to a unique wooden viewing tower. 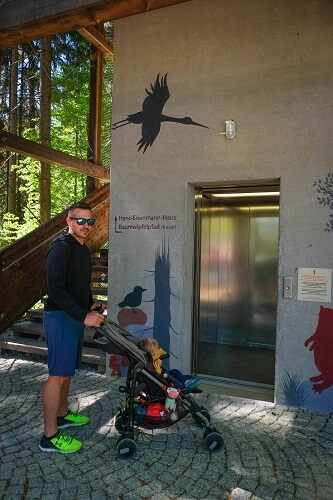 Even though we visited the Bavarian Forest for the Sky Walk only, we were really impressed what else these region offers to its visitors. There were so many things we wanted to do there, but because having only one night booked, we decided that this was not our last visit. 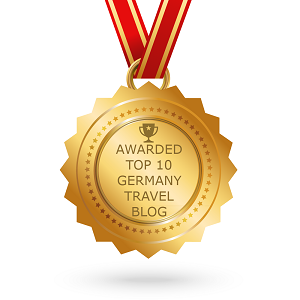 What not to miss when visiting the Bavarian Forest? 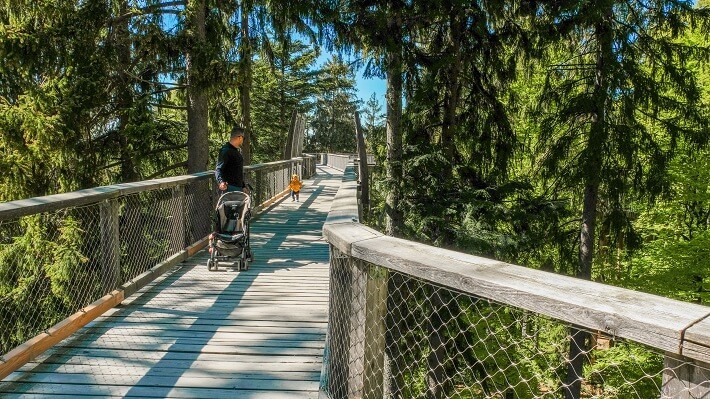 The Baumwipfelbad Sky Walk (48.892377 / 13.488994) can be found right at the entrance to the Bavarian Forest National Park at the outskirts of Neuschönau town. 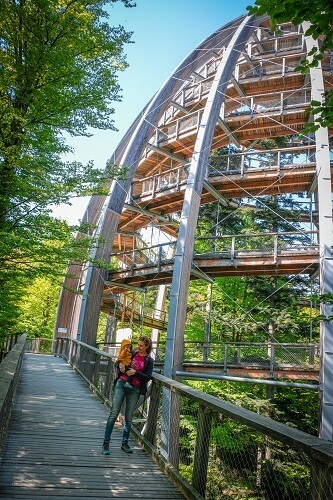 Even though you might not be thrilled over nature, you should stop here at least for the Sky Walk Baumwipfelbad. It is so amazing how you can join architecture in a protected area and due to its learning information along the way even increase its value. 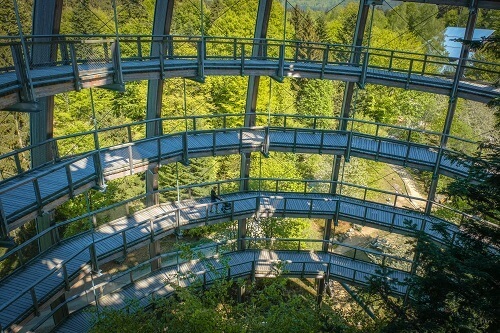 The Baumwipfebad Sky Walk is 1300 meters long and takes us right to the 44 meters high viewing tower, shaped as a dome. The views in a clear weather are spectacular – even the snowy mountain peaks in the Alp scan be seen from up there. 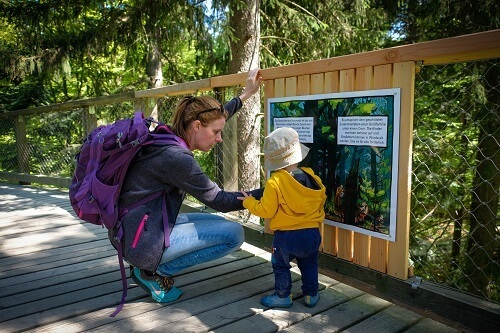 The whole Sky Walk offers lots of information about Bavarian Forest, which are also adjusted for the youngest visitors. 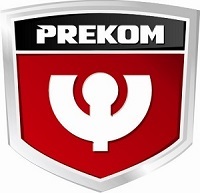 Kids will not only learn from them, but will join learning with doing some fun motoric skills along the way. 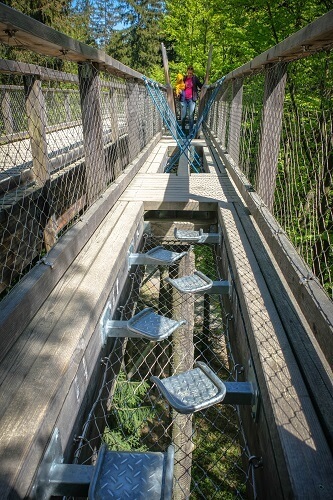 What we really liked there, was the fact that the whole Sky Walk with the viewing tower included, is suitable for wheelchairs and baby strollers. 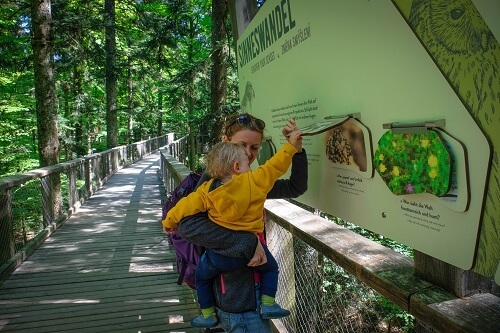 Just steps away from the parking lot (48.892377 / 13.488994), where you can leave your car during Baumwipfeld visit, is a the Tierfreigelande -a large area with 40 different species of wild animals, living in the Bavarian Forest. 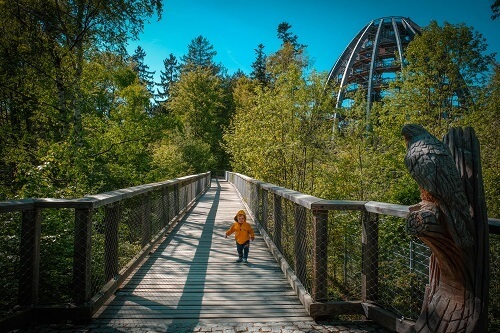 The whole round route is set in the forest, but it is still perfect for wheelchairs and baby strollers. The animals can be seen behind a fence, but some are hardly visible, so you can easily get the feeling you see these animals walking freely in the wild. 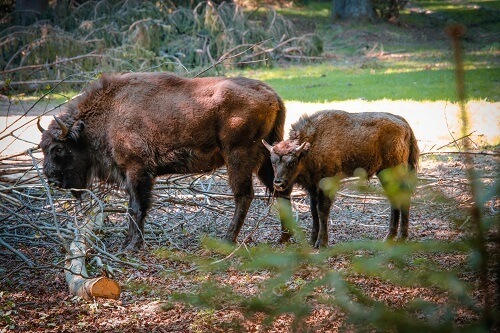 Apart from the more common wild animals like wolfs, bears, owls, fox, deer, you can even see the European bison. If you are in good cycling condition, you will love the fact that the Bavarian Forest national park has 200 kilometers of maintained paths. The cycling paths even connect another national park Šumava in the Czech Republic. Even though you need to be in a good fitness condition, you don’t necessary need mountain bikes to ride these paths. 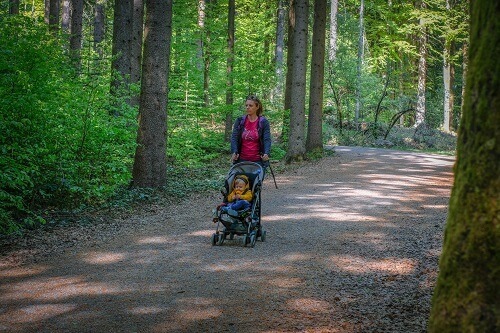 Believe it or not, but the Bavarian Forest National Park is not just a nice summer destination. In fact, it is also great during winter. There are many skiing trails and ski-cross country possibilities. 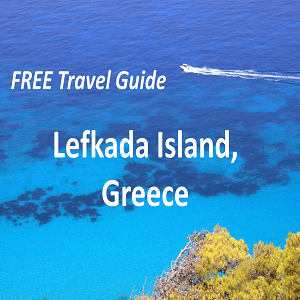 You can even enjoy tobogganing or a guided walk with snowshoes. If I would knew how many blue berries grow in the Bavarian Forest, I might even plan this trip a month or two later, when there’s the high season for them. We love these wild fruits and seeing all the bushes full of them, should really be something for pur eyes and mouths. 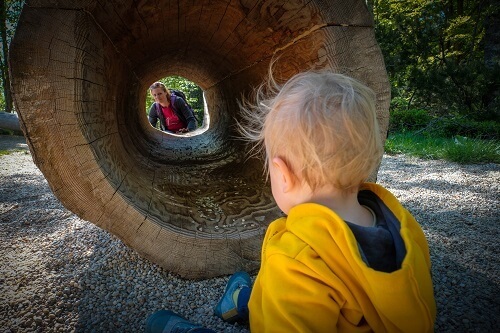 The Bavarian Forest National Park is a great destination for kids and with that for families. 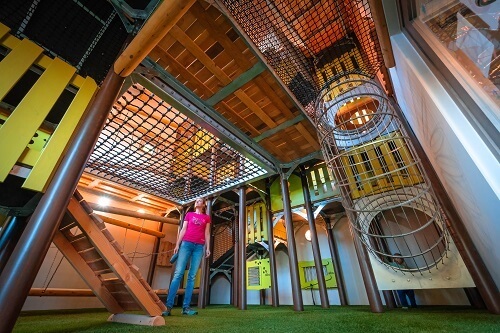 You won’t only find playgrounds there, but all kind of activities, which your children will like more than all the playgrounds for sure. The main activities are the Baumwipfelbad and the Tierfreigelande, but they can even try themselves in gold searching, making their own glass bowl, which can be taken home as a souvenir, canoeing, meeting the alpacas, horse riding and horse carriage driving… During the winter they can also take part in different winter sports. 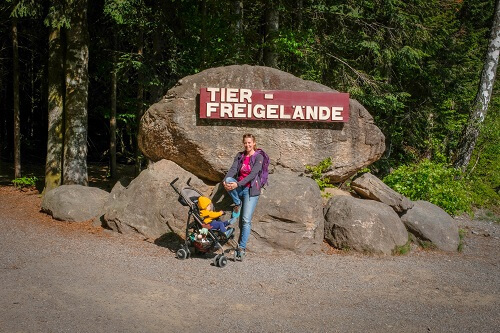 Due to our limited time, which we spent in the Bavarian Forest, we only experienced a tiny part of everything that this area offers, but that is only one great reason to be back again. 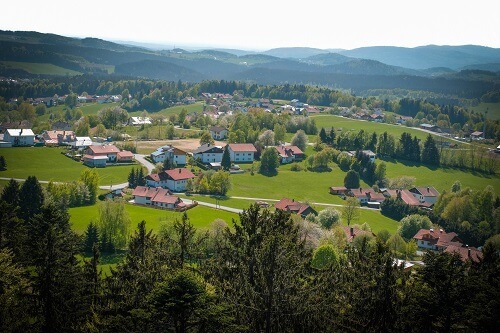 The Bavarian Forest National park offers a wide range of accommodations for every budget and style. 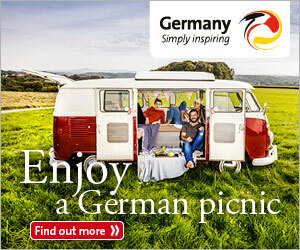 A small town like Neuschönau already offers some, which you can check here. 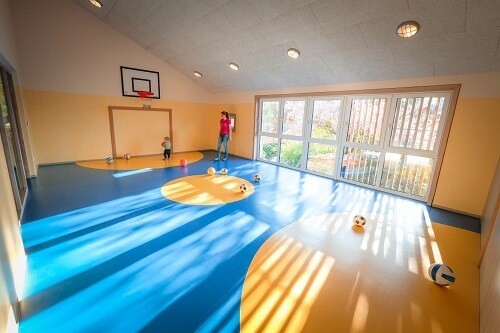 Ever since we spent one night in the family/kids hotel in Garmisch-Partenkircheim last year, we wanted to find something similar again. 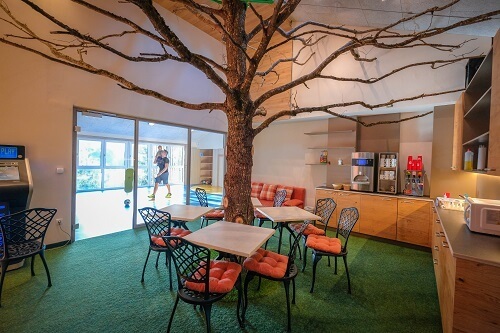 It is so enjoyable to stay in a hotel, where the kids come first and where you can also take some time for yourself because of that. The Familotel Bayerischer Wald was great and Ren loved it there. 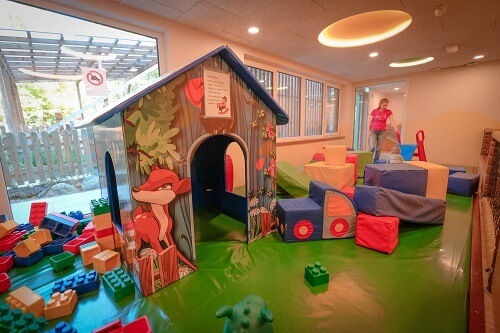 So many playing areas for all ages (indoor and outdoor), indoor swimming pool, adjustable meals if your child has any allergies, all-inclusive program, where food and drinks are accessible from early morning to late evening, babysitters, animations… and lots of patient for the little guests. We had the all-inclusive program in the Familotel Bayerischer Wald and that is why we only ate out once. 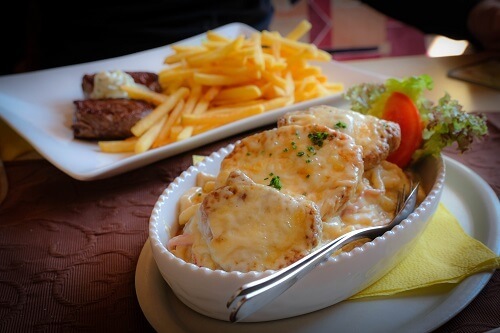 We reached the Neuschönau town for lunch and found delicious and good priced food in the Restaurant/Cafe Liz (48.884002 / 13.474071). The staff speaks good English and there are even English menus available. Highly recommended!